Kevin Betsy scored a dramatic stoppage-time winner to keep Wycombe's survival hopes alive in a thrilling Bucks derby. Alex Revell converted Betsy's cutback to put Wycombe ahead but a close-range header from Aaron Wilbraham squared it. Revell fired the visitors back in front but Wilbraham again levelled, scuffing home the rebound after Tom Heaton had saved Sam Baldock's penalty. Betsy then grabbed a winner five minutes into added time, wriggling free in a crowded box and blasting home. "You can blame luck, but you can also blame individual errors that you can't compensate for. "We have lost 15 points in injury time this season and that is an unbelievable stat. "We have to roll our sleeves up and go again." "What a game. One hell of a game between two good sides having a go in a derby game. "We needed the points obviously with the situation we are in, but the players did an excellent job today, I'm delighted for them." 90:00+5:33 The game is over, as the referee blows his whistle. 90:00+4:31 GOAL - Kevin Betsy:MK Dons 2 - 3 Wycombe Goal scored by Kevin Betsy from deep inside the penalty area to the bottom left corner of the goal. Milton Keynes Dons 2-3 Wycombe. 90:00+3:40 Aaron Wilbraham gives away a free kick for an unfair challenge on Craig Woodman. Free kick taken by Craig Woodman. 90:00+3:00 Stuart Beavon produces a right-footed shot from outside the penalty area and misses left. 90:00+1:07 Foul by Dean Lewington on Gareth Ainsworth, free kick awarded. Lewis Hunt takes the free kick. 90:00+0:51 Adam Chicksen challenges John Mousinho unfairly and gives away a free kick. John Mousinho takes the free kick. 88:47 Stuart Beavon produces a left-footed shot from the edge of the box and misses to the left of the goal. 88:11 Corner taken by Craig Woodman, Aaron Wilbraham manages to make a clearance. 87:46 Free kick awarded for an unfair challenge on Matt Bloomfield by Aaron Wilbraham. Chris Westwood takes the direct free kick. 86:44 Corner taken right-footed by Kevin Betsy to the near post, Lewis Hunt has a headed effort at goal from close in which goes wide right of the goal. 85:45 Free kick awarded for a foul by Luke Chadwick on Matt Phillips. Direct strike on goal from the free kick comes in from Alex Revell. 85:07 Kevin Betsy gives away a free kick for an unfair challenge on Adam Chicksen. Dean Lewington takes the free kick. 84:49 The official flags Sam Baldock offside. Free kick taken by Lewis Hunt. 84:05 Matt Bloomfield concedes a free kick for a foul on Mathias Doumbe. Willy Gueret restarts play with the free kick. 83:34 Chris Westwood fouled by Sam Baldock, the ref awards a free kick. Free kick taken by Kevin Betsy. 82:56 Effort from close range by Stuart Beavon goes wide left of the target. 79:37 Tom Heaton takes the direct free kick. 79:37 Substitution Stuart Beavon joins the action as a substitute, replacing Lewis Montrose. 79:37 Booking Booking for Luke Chadwick for unsporting behaviour. 79:25 Foul by Luke Chadwick on Lewis Montrose, free kick awarded. 77:00 Alex Revell handles the ball and concedes a free kick. Tom Heaton takes the free kick. 75:47 Inswinging corner taken by Craig Woodman from the right by-line. 74:46 GOAL - Aaron Wilbraham:MK Dons 2 - 2 Wycombe Goal scored by Aaron Wilbraham from inside the six-yard box to the bottom right corner of the goal. Milton Keynes Dons 2-2 Wycombe. 72:59 Penalty taken by Sam Baldock saved by Tom Heaton. Milton Keynes Dons 1-2 Wycombe. 72:59 Luke Chadwick fouled by Gareth Ainsworth, the ref awards a Penalty. 68:32 Free kick awarded for a foul by Luke Howell on Lewis Hunt. Direct free kick taken by Tom Heaton. 67:29 Inswinging corner taken from the left by-line by Mark Randall, save by Tom Heaton. 64:10 Substitution Matt Phillips on for Jon-Paul Pittman. 63:11 Assist on the goal came from Kevin Betsy. 63:11 GOAL - Alex Revell:MK Dons 1 - 2 Wycombe Alex Revell finds the back of the net with a goal from inside the penalty area to the bottom right corner of the goal. Milton Keynes Dons 1-2 Wycombe. 62:31 Sam Baldock takes a shot. Blocked by Lewis Hunt. 58:36 Dean Lewington takes a shot. Save by Tom Heaton. 58:19 Aaron Wilbraham takes a shot. Blocked by Lewis Hunt. 53:02 Substitution Dan Woodards goes off and Sol Davis comes on. 51:28 Jon-Paul Pittman has an effort at goal from the edge of the area that misses to the right of the target. 50:48 John Mousinho challenges Luke Chadwick unfairly and gives away a free kick. David McCracken takes the direct free kick. 50:03 Inswinging corner taken left-footed by Craig Woodman, Willy Gueret makes a save. 48:37 Aaron Wilbraham takes a shot. Chris Westwood gets a block in. Sam Baldock takes a shot. Save by Tom Heaton. Corner taken short by Mark Randall, Adam Chicksen takes a shot from just outside the penalty area which clears the crossbar. 46:00 Kevin Betsy fouled by Luke Chadwick, the ref awards a free kick. Kevin Betsy crosses the ball in from the free kick, clearance by Dean Lewington. 45:18 Inswinging corner taken left-footed by Craig Woodman from the right by-line to the near post, clearance by Sam Baldock. 45:00+3:39 It is the end of the first-half. 45:00+2:16 Mark Randall provided the assist for the goal. 45:00+2:16 GOAL - Aaron Wilbraham:MK Dons 1 - 1 Wycombe Aaron Wilbraham finds the net with a goal from close range to the top right corner of the goal. Milton Keynes Dons 1-1 Wycombe. 45:00+1:45 Free kick awarded for an unfair challenge on Luke Chadwick by Matt Bloomfield. Mark Randall restarts play with the free kick. 45:00+1:20 Free kick awarded for an unfair challenge on Aaron Wilbraham by Lewis Hunt. Dean Lewington takes the direct free kick. 42:35 Headed effort from deep inside the area by Aaron Wilbraham misses to the right of the goal. 40:55 Inswinging corner taken by Craig Woodman, Luke Howell manages to make a clearance. 40:04 Aaron Wilbraham takes a shot. Save by Tom Heaton. 38:02 Unfair challenge on Gareth Ainsworth by Dean Lewington results in a free kick. Kevin Betsy crosses the ball in from the free kick. 35:30 Headed effort from deep inside the area by Sam Baldock misses to the right of the goal. 34:20 Craig Woodman takes the inswinging corner, save by Willy Gueret. 33:27 Corner taken right-footed by Mark Randall, save made by Tom Heaton. 32:13 Corner taken by Mark Randall, clearance made by John Mousinho. 30:56 The assistant referee signals for offside against Aaron Wilbraham. Tom Heaton takes the indirect free kick. 28:47 Kevin Betsy provided the assist for the goal. 28:47 GOAL - Alex Revell:MK Dons 0 - 1 Wycombe Alex Revell fires in a goal from just inside the area to the bottom right corner of the goal. 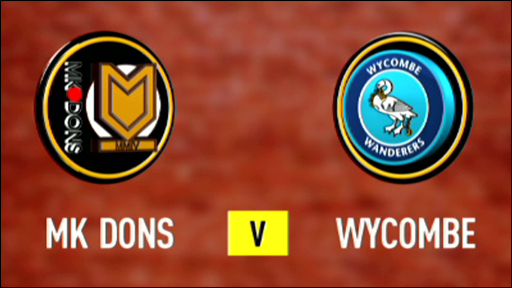 Milton Keynes Dons 0-1 Wycombe. 28:12 Adam Chicksen is penalised for a handball. Lewis Hunt takes the direct free kick. 26:42 The assistant referee flags for offside against Jon-Paul Pittman. Free kick taken by Willy Gueret. 26:04 Matt Bloomfield takes a shot. Blocked by David McCracken. 24:45 Foul by Craig Woodman on Luke Chadwick, free kick awarded. Mark Randall restarts play with the free kick. 24:02 Luke Chadwick takes a shot. Save by Tom Heaton. 22:22 Handball by Lewis Montrose. Direct free kick taken by Mark Randall. 21:38 Jon-Paul Pittman gives away a free kick for an unfair challenge on Dan Woodards. Free kick taken by Willy Gueret. 21:07 John Mousinho fouled by Aaron Wilbraham, the ref awards a free kick. Tom Heaton restarts play with the free kick. 20:11 Sam Baldock produces a right-footed shot from just outside the penalty box that misses to the left of the goal. 14:13 Dan Woodards challenges Kevin Betsy unfairly and gives away a free kick. Chris Westwood takes the free kick. 11:58 Effort on goal by Sam Baldock from deep inside the penalty area misses to the right of the goal. 11:11 Foul by Jon-Paul Pittman on Mathias Doumbe, free kick awarded. Willy Gueret restarts play with the free kick. 9:30 Substitution Luke Howell on for Mark Carrington. 6:35 Shot from just outside the area by Matt Bloomfield goes over the bar. 5:59 Gareth Ainsworth gives away a free kick for an unfair challenge on Dean Lewington. Direct free kick taken by Mark Carrington. 4:16 Corner taken by Kevin Betsy from the left by-line, save by Willy Gueret. 3:53 Jon-Paul Pittman takes a shot. Blocked by Mark Randall. 0:44 The assistant referee signals for offside against Mark Carrington. Tom Heaton takes the indirect free kick.